The colors of the flag of Cambodia hold great significance to the nation. The two colors represent the bravery of the nation, liberty, cooperation and brotherhood. The flag also features a depiction of the Angkor Wat, which symbolizes justice, heritage and integrity. Combined, these elements also represent the nation’s religion, the king, and its people. 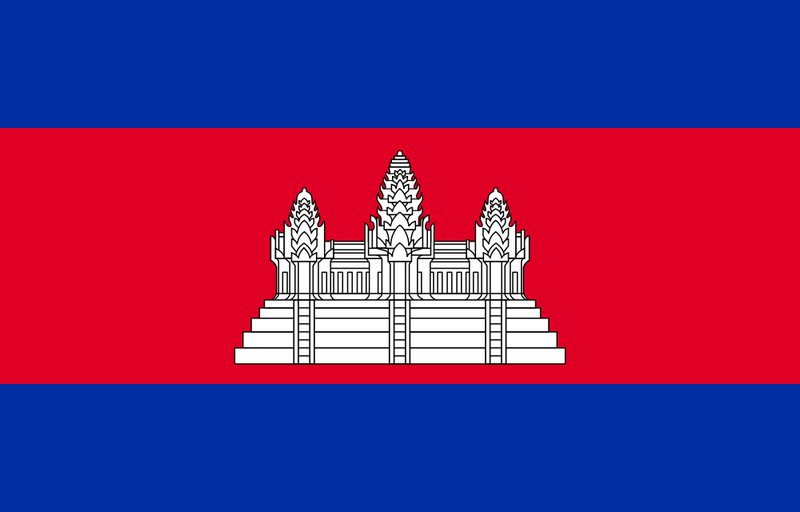 There are three colors used in the Cambodian flag. The flag features two blue horizontal stripes at the top and bottom of the flag. A red band that is double the width of the blue bands runs through the flag’s center. The Angkor Wat is depicted in white in the center of the flag. The color red is designed to represent bravery. The color blue represents cooperation, livery and brotherhood. One of the first known flags flown in what is now Cambodia was the flag of the Khmer Empire, which was flown before 1863. This was a green and yellow pennant flag. The flag of the Kingdom of Cambodia replaced the original flag under the control of the French and the Japanese, from 1863 through 1948. A similar flag was flown during the French protectorate and after the nation gained its independence. It was again brought back in 1993 when the monarchy was restored. Throughout the 1970s through early 1990s, the nation had several flags that were used, including the Flag of the Khmer Republic, the flag of the People’s Republic of Kampuchea and the flag of the State of Cambodia. The current flag was previously used in 1948 through 1970, and it was readopted in 1993 and still flies over the nation today. The Cambodian flag is just one of four state flags that feature a building. Red and blue are the traditional colors of the nation. Since the late 19th century, the flag of Cambodia has featured a depiction of Angkor Wat.